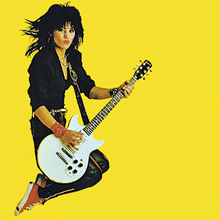 This entry was posted on September 26, 2016 at 12:06 pm and is filed under 1980s, Heavy Metal, Heavy Metal and the 1980s, Music, Rock, Uncategorized with tags Album, Classic Rock, hard rock, Heavy Metal, Heavy Rock, I Love Rock and Roll, Joan Jett, Joan Jett and the Blackhearts, Pat Benatar, The 1980s. You can follow any responses to this entry through the RSS 2.0 feed. You can leave a response, or trackback from your own site. I do like me some Joan. Not her best this one, but I agree it gets better and better as it goes on. Only really started listening to Joan and don’t yet own any LPs, but I really like the cover for this one and, therefore, I want it! Just skip the first track and enjoy the rest of the album. I actually don’t own any Joan Jett. I don’t know why. I was always more a Lita guy. Apparently, they still can’t stand each other. I don’t know if that’s true for sure though. In getting into Joan, I would definitely recommend “I Love Rock And Roll” before delving into this one. The last interview I read with Lita by Mitch Lafon implied there is still a lot of animosity there. I don’t understand why but Lita does sound a little bitter. Wow, but it would be interesting to hear how Joan feels about it. It’s really too bad. How much would people pay to see those two on the same stage? I’d definitely go see them.